History: Water Safe Solutions, Inc. is a “triple bottom line company” established for the purpose of designing, manufacturing, selling and maintaining sustainable water purification systems for use in the public and private sectors, residential and industrial, in the US and internationally. Core product line: WaterSafe produces a range of point-of-use water (“POU”) systems, designed for easy operation in industrial or residential markets, using surface or municipal water, to produce drinking water that meets US Environmental Protection Agency (“EPA”) and World Health Organization (“WHO”) standards. Since the systems are POU, the need to chlorinate after a long journey through possibly contaminated pipes is eliminated. Units range in size from 600 gallons per day (“GPD”) to 15,000 GDP scalable to 1,000,000 GPD for industry and communities. Applications: Examples are hospitals, hotels and restaurants, drinks manufacturers (including soft drinks and breweries), paper mills, the construction industry, agriculture (including hydroponics), animal husbandry, the oil and gas industry (including remediation of fracking water), and the aid and development sector. 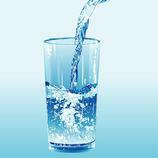 Dynamic Adsorbents, Inc.: WaterSafe holds the rights under license from DAI to nanotechnology media for its drinking water purification to remove biological, medical and heavy metal contaminants, and cooperates with DAI on industrial applications, including fracking water and oil spill remediation. WaterSafe provides engineering solutions that maximize the impact and effectiveness of DAI’s specialized media. Ningbo Qinyuan Group: Ningbo Qinyuan is a Chinese brand leader in home and office commercial water purification systems, with a 500+ sales force throughout China. WaterSafe represents Ningbo Qinyuan for its industrial systems worldwide. Hangzhou Smartem, a division of Ningbo Qinyuan, also fabricates the modular shell components for WaterSafe, which are then filled with US certified media. American River International: WaterSafe’s global freight forwarders, who assist with individual country customs, bonding and other issues. → Low energy consumption: WaterSafe’s low-pressure systems can be self-powered, via hybrid solar/diesel and other efficient green systems, potentially cutting power consumption by two-thirds, versus standard Reverse Osmosis (“RO”)/Ultraviolet (“UV”)/activated carbon combination units. → Low waste factor, High production: Unlike RO systems, which produce 30 liters clean water for every 100 liters processed, leaving the other 70 liters more heavily contaminated, WaterSafe conserves precious water resources, delivering over 90 liters of safe water for every 100 liters processed. → Sustainable: Most systems can be operated by two technicians. They are modular (components can be easily bypassed or replaced), and run 24 hours per day, backwashed while running. 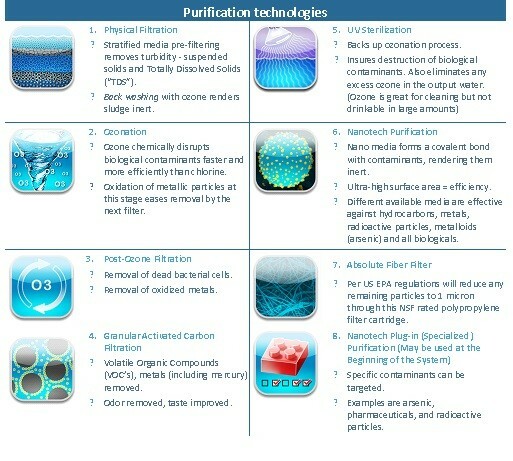 → High effectiveness versus almost all contaminants: Destroys biological, industrial and pharmaceutical contaminants. Specialized nanotechnology media forms a covalent bond with contaminants such as arsenic rendering them inert. Can be configured for a large and varied set of contaminants, including radioactivity, turbidity, acidity, and specific pathogens. 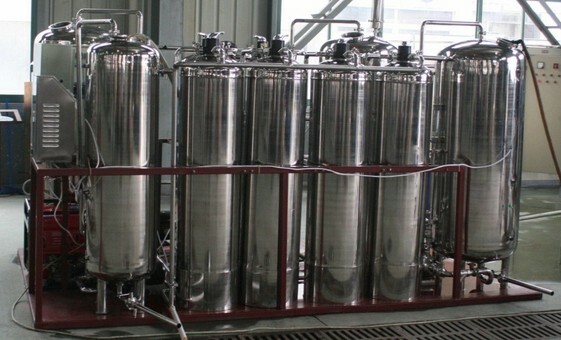 → Low operating costs: User-friendly system requires minimal technical skills, minimal energy, and, unlike membranes, which are subject to biofilm buildup, purification media requires less frequent replacement in part due to the modular/redundant nature of the equipment, which permits maintenance phases while still producing clean water. Technical specifications: There are three core systems available for distribution (a 5,000 GPD unit. 15,000 GPD unit and 600 GPD portable unit). Specific projects are currently under development for village water kiosks for developing regions and large scale industrial and commercial installations. WaterSafe CS20 – A New Concept in Water Filtration provides 5,000 gallons per day/20,000 liters, 20 cubic meters (m3) per day of clean drinking water. This unit can be enclosed and loaded, with spare parts and power unit (type based on area of use) on a truck for use in a larger geographical area during emergencies or it can be placed in one location for continuous community use. 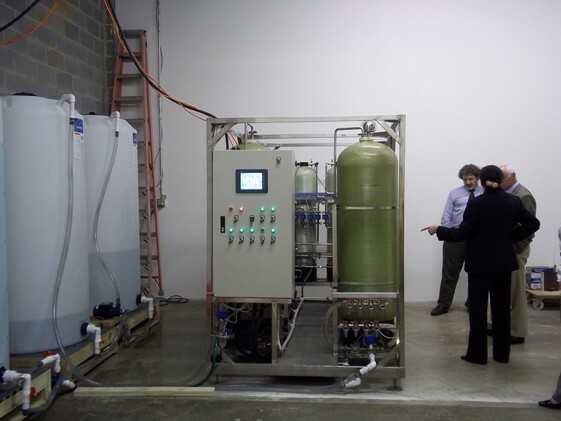 The unit pictured below is a 7,000 GPD model with auxiliary input and output tanks installed at WaterSafe’s facility in Gaithersburg, Maryland. It can be ruggedized and mobilized – pulled by an SUV. WaterSafe CS60, a larger stationary configuration (shown below) provides 15,000 gallons / 57,000 liters/ 57 m3 per day. This unit pictured below is currently located in the earthquake zone in Sichuan, China. This is our new portable unit (600 GPD), originally designed for use by restaurants, homes, and easy application in the field by aid agencies. It stands 10” high as shown in comparison to Eng. 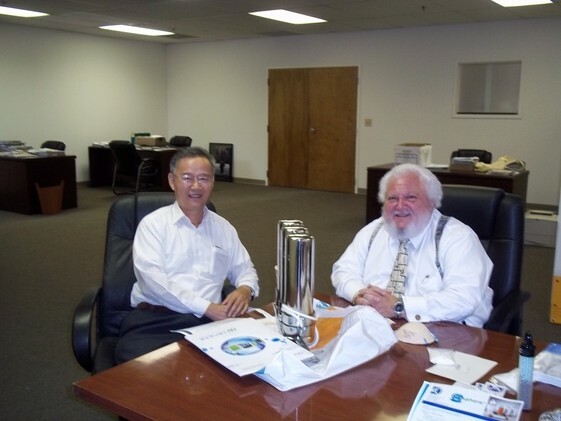 Huichang Zhu and Dr. Mark Moskovitz at DAI’s facility in Atlanta, Georgia. A 2,000 GPD unit is also available. For field use, portable in a backpack, we have a special 600 GPD unit with collapsible hand pump under design. WaterSafe will customize systems for a variety of applications for permanent, back-up or mobile emergency use. Back-up generators are available. In addition, WaterSafe has the expertise to design hybrid power sources suitable in each case to the point of use. In-country partners will be contracted by WaterSafe to supply maintenance and spare parts. 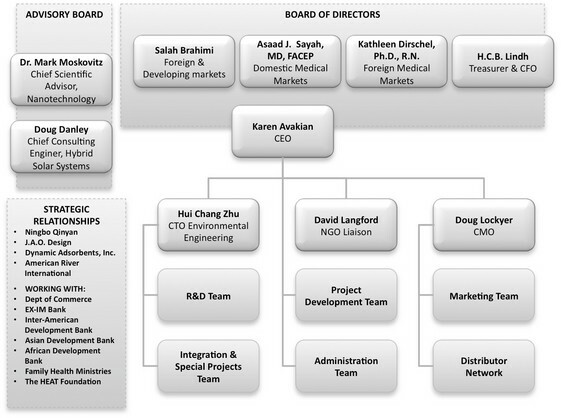 Leadership: The following organogram illustrates executive, advisory and consultative roles. A specialist in international trade, technology and development, with extensive experience and key relationships in Europe and in China. Founder and Managing Director of the Vapor Tech Companies in The Netherlands. Belgium and Spain from 1992 through 1999. These companies produced and operated US patented, environmentally friendly, chemical cleaning systems for the heavy fuel oil industry. Former CFO for several Wall Street investment firms and CPA of “Big Five” accounting firm. Mr. Lindh has worked on special assignments for the NYSE in Tunisia. Very active in the not–for-profit field as a board member, treasurer and president of several charitable organizations. 30+ years of experience in engineering, design and management in the fields of water and wastewater treatment. Former engineer at Shanghai Design Institute of Light Industry of China in charge of designing large-scale water and wastewater treatment projects, CEO and CTO for water treatment and engineering companies in China, one of the largest paper companies in Asia, Coca-Cola, the pharmaceutical and microchip industry. Former President of the American College of Emergency Physicians for the State of Massachusetts. Teaches at Harvard and Tufts. Currently medical director of American Medical Response Northeast and manages trauma at three hospitals in Boston. Former head of nursing at Columbia Presbyterian Hospital in New York, and former head of the New Jersey Board of Nursing, Dr. Dirschel currently directs the school of nursing, staff development and community education at St. John’s Riverside Health Care System. She lectures on medical issues internationally. As the CEO of Grey Matter International Ltd. - a “network of networks” – Mr. Brahimi utilizes his experience as a former senior executive at the World Bank and other European and Middle Eastern corporate enterprises to advise WaterSafe on financial and structuring issues. Dr. Moskovitz is a biochemist with 40 years of experience in chromatography and nanotechnology. Extensive lecturing history with leading universities, holder of over 20 patents and publisher of over 25 papers in international scientific journals and Editor-in-Chief of two leading Chromatography and Biotechnology publications. Vast engineering experience in the US and developing regions, including SAIC, Integrated Power Corporation, GridPoint, and Orion Energy Corporation, working in R&D for water pumping systems, hybrid and renewable energy systems, and rural electrification. Has installed water systems in Botswana, solar systems in Togo and is an expert in developing low-energy systems for the green market. He is a graduate of MIT and author of multiple publications on water and energy systems. Currently consultant to UN on internal communications and advisor to UNDP on inclusive market strategies and micro-franchising Social entrepreneur, technologist and global brand strategist with IPO history, Fortune 1000 consulting experience and extensive field exposure in South East Asia and Latin America. Strong ties to the UN and the international development community. Professor of chemistry and engineering specializing in water treatment, waste disposal and environmental impact of soil and ground water contamination. WaterSafe combines its skills in chemistry, engineering, research and development to provide its clients with customized solutions for their water purification issues.